Get the BOOTCAMP Training for TAKING ON THIS ECONOMY—Right at Home Base! The very first CD in this program gets right to the economic challenges you're faced with now—and the four factors that GUARANTEE you'll prosper! Because, remember, NOW is the time to STRIKE IT RICH! That means you'll generate lasting wealth—even if you send the program back at any time within ONE YEAR for a refund. CD 3: You Are Worthy of a Millionaire Mind! ACT NOW and in addition to the eight CDs and writable PDF workbook, you'll ALSO receive two exclusive tickets to T. Harv Eker's world-famous three-day event, The Millionaire Mind Intensive! That's right! You and one guest can attend this rockin', high-energy event—and get real, LIVE coaching from T. Harv Eker—wherever his event is held, anywhere around the world! These tickets—an incredible value of $2,590—are Harv's GIFT to you, just for trying his NEW Nightingale-Conant program! What a GIFT! What an opportunity! Louise P. said, "After the seminar my 37-year-old son gave me a great big hug and with tears in his eyes he thanked me for giving him the greatest gift of his life! I saw him transform right before my own eyes! Thank you!" HURRY! This FABULOUS offer is time-sensitive! Yes! I want to raise the heat on my inner money thermostat to a Millionaire Mind's setting so I can turn this economy into my greatest opportunity to strike it rich! 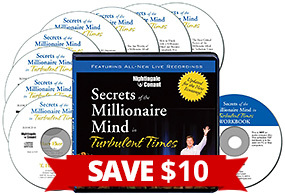 Please send me T. Harv Eker's 8-CD audio program Secrets of the Millionaire Mind in Turbulent Times plus writable PDF Workbook today - for just $79.95, which is $10 OFF the regular program price.